Enjoy a FUN day at Lands in Love Adventure Park while traveling from San Jose to La Fortuna and vice versa. Lands in Love Adventure Park's ideal plan of combining their different excursions "a-la-carte" offers unlimited options for everyone to enjoy at their own pace. So, if you got a mixed group with kids and adults, nature lovers and adrenaline seekers, each can design his/her own adventure! 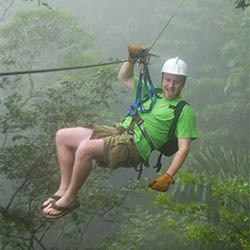 Select the options below to learn more about each activity then choose your own Costa Rica adventure! A Day Pass is also available for those wanting to come along for the ride! Even though you don't book one of the on-site adventures, there's still A TON to do at Lands in Love. Book your Day Pass and enjoy the trails, the wildlife, the food and Lands in Love's great facilities! Transportation and lunch are included. 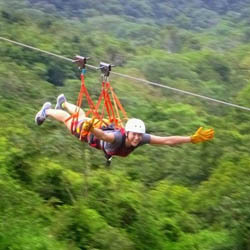 All the top activities in Costa Rica and all in one place: Lands in Love Adventure Park!! When is a canopy tour not just an ordinary canopy tour? Easy! When it's the Lands in Love Canopy and Adventure Cables Tour of course! The San Lorenzo Adventure Park has cables and platforms just like a regular canopy tour, but there is where the similarities end. This is not just any canopy tour in Costa Rica, it's an adventure! Children: 3 years and older for the canopy. Please check age requirement for other activities when booking in combo. Children pay same price as adults. Restrictions: Max. weight is 275lbs for the Canopy and Adventure Cables Tour. This adventure is not suitable for pregnant women and for people with heart, back or neck problems. Please check other restrictions if applicable when booking in combo with other activities. Get up close and personal with the cloud forest canyons found at our San Lorenzo Adventure Park, on the Lands in Love Pure Trek Canyoning! Perfect for beginners as well as more seasoned rappellers, canyoning in Costa Rica is an excellent way to explore the jungle landscape from new vantage points... mixed with adrenaline and adventure that is! Children: Children 6 years and older can participate on the Pure Trek Canyoning. Please check age requirement for other activities when booking in combo. Children pay same price as adults. Restrictions: This adventure is not suitable for pregnant women and for people with heart, back or neck problems. 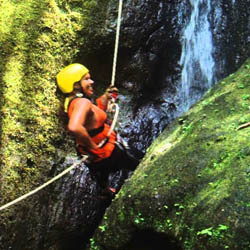 Canyoning requires physical effort; participants must be in good physical health. If booking in combo with other activities, please check if additional restrictions may apply. 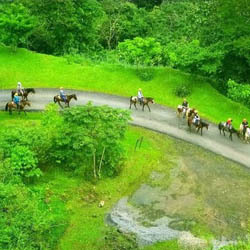 Why hike your way through the cloud forest, when you can hitch a ride on one of our friendly horses instead? Experience the Lands in Love Horseback Riding Tour at the San Lorenzo Adventure Park, and you'll be traversing the cloud forest landscape just like a local! There is nothing like getting in touch with the rugged beauty of the Costa Rica cloud forest while in the company of these graceful, gentle giants. Children: 6 years and older to participate in the Horseback Riding tour. Please check age requirement for other activities when booking in combo. Children pay same price as adults. Restrictions: Max. weight to ride is 260lbs. This activity is not recommended for pregnant women or people with back or neck problems. If booking in combination with other activities, please check if any additional restrictions may apply. Calling all nature lovers! 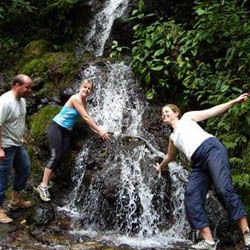 Experience the magic of the Costa Rica cloud forest on the Lands in Love Cloud Forest Hiking Tour! Learn all about cloud forests and how they contribute to the unique biodiversity enjoyed by visitors, residents, and scientists alike in Costa Rica, as we meander our way through the network of trails lining the forest floor of the San Lorenzo Adventure Park. Children: All ages are welcome! Please check age requirement for other activities when booking in combo. With an almost unreal amount of rivers crisscrossing Costa Rica, it's no wonder that world class rapids are plentiful here. 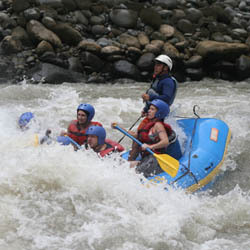 Land the Lands in Love White Water Rafting tour at the San Lorenzo Adventure Park is your perfect chance to experience white water rafting in Costa Rica it up close and personal! Children: Children 6 years and older can participate on the Whitewater Rafting Tour. Please check age requirement for other activities when booking in combo. Participants on Rafting Class V must be at least 18 years old to take part on this trip. Children pay same price as adults. Restrictions: All skill levels are welcome! Yet, this adventure is not recommended for pregnant women and for people with heart, back or other medical conditions that might put your health at risk. Please check if additional restrictions may apply according to the tour combination selected. Fly like Superman across a 750m cable! Speed and adrenaline maximize your adventure adding up to your existing selection of amazing activities. At Lands in Love's San Lorenzo Adventure Center is all about the FUN! Choose the Superman Cable and add the extra boost for a THRILLING experience at Lands in Love Adventure Park. And you can find them all in ONE place: at Lands in Love Adventure Park!! Light Breakfast included when departing from San Jose only. Your choice of Canopy and Adventure Cables Tour, Canyoning, Horseback Riding, Cloud Forest Hiking, Whitewater Rafting and the Superman Cable Add-on. Departures: Daily at 6:30 AM from San Jose and 7:30 AM from La Fortuna. Length: Each activity lasts between to 1.5 to 3 hours so full tour length depends on the number of activities you choose. This is a full day activity however due to the continuing transportation. Children: Please check age requirement for other activities when booking in combo. Children pay same price as adults. Restrictions: Please refer to each activity for detailed restrictions according to your selection. The beauty of Lands in Love Adventure Park can be enjoyed by EVERYONE, whether you choose to partake in any of the many activities offered on site or if you just want to come along and hang out! The Lands in Love Day Pass allows you to join your family or group, or come on your own if you please, to enjoy the hotel premises and the gorgeous natural setting this place has to offer. Over 20km of nature trails perfect for leisure hikes and bird watching (there are hundreds of bird species recorded in the area! ), a beautiful Orchid Greenhouse, a refreshing swimming pool, a Jacuzzi and an on-site restaurant with a delicious international and kosher menu, Lands in Love Adventure Park has everything you need to keep you entertained for the whole day. Your Day Pass includes transportation and lunch. So come and join us for a relaxing and fun day in nature at Lands in Love Adventure Park.